PITTSBURGH - Imagine lying in a large open field, supporting a long-range rifle. You gaze down the barrel through iron sights attempting to hit a target 600 yards away while using just your hands to support the weight of the weapon. The slightest mistake, movement, or even just a breath of air is the difference between missing your target or hitting a bulls eye. This past summer at Camp Perry, Ohio, Master Sgt. 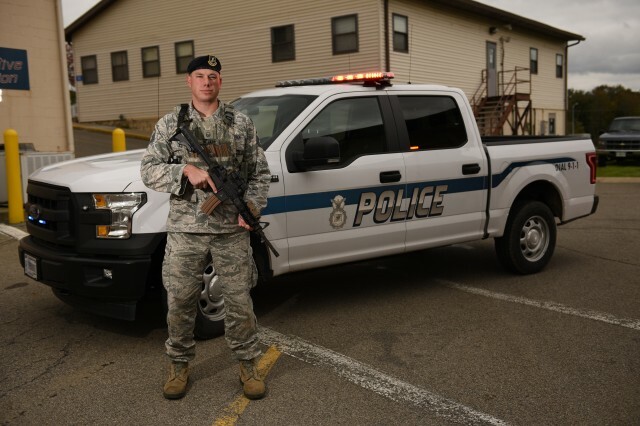 Eric Moskal of the Security Forces Squadron at the 171st Air Refueling Wing in Pittsburgh hit that target. Moskal competed in the President's Rifle Match, a National Trophy Rifle Match, which is only held once a year. In the competition, the participant must take 10 shots from a standing position at a target placed 200 yards away within 10 minutes. Next, he or she must rapidly hit a 300-yard target 10 times within 70 seconds before continuing. Only the top 20 competitors move onto stage three, which requires participants to fire from the prone position at a target 600 yards away with only 50 seconds per shot. Moskal stood tall among the best military and civilian marksmen by placing 83rd out of 1,072 competitors. Having placed in the top 100, Moskal is authorized to wear the President's Hundred Brassard. The brassard is a small patch worn on the competitor's right sleeve just below the shoulder. This brassard shows that Moskal is among the best 100 marksmen in the country. Having achieved his goal, Moskal wants to improve his performance in the next competition by upgrading his rifle and using a scope. "My new goals are to become a Distinguished Rifleman and to make the shoot off in the President's match," said Moskal. Moskal has been involved with some form of law enforcement for over a decade. He has been with the 171st Security Forces Squadron for 18 years as a drill status Guard member and he also worked for the Pennsylvania Department of Corrections for 10 years before challenging himself even further with the Pennsylvania State Police Academy. He now protects the Keystone State as a Pennsylvania State Trooper stationed in Uniontown.